I remember the first time my husband came home to tell me he’d received military orders to a base across the country. And we'd be leaving in just a couple of months. I’m laughing with you now over my naiveté, but like many young military spouses, I truly didn’t know what I didn’t know. 1. Don't you know who my husband is? Or wife. Regardless, if you ever reach the point of needing to pull THIS lulu out in a conversation, you might need to do a little soul searching. 2. My spouse won’t deploy anytime soon. Have you heard of Murphy’s Law? Find some wood to knock on…quickly! 3. I would never live in ____ (fill in the blank). Why would you ever tempt fate this way? Just as soon as you say those words, whether it’s applied to an overseas base because you don’t want to be far from family or the northern tier because you don’t like the cold, sure as shootin’ you’ll have orders! 4. We know we won’t be moving this year! The military said so! One thing military spouses learn is the fine art of flexibility. Just because something is true one day doesn’t mean it will be true the next week, day, or even hour. 5. Let me know if you need help. Military spouses are the best folks to have around in times of crisis, illness, or even good news like a brand new baby. We’ll be the ones in the background bringing casseroles or running loads of laundry without being asked. I'd bet the Nike slogan “Just Do It!” was coined by a military spouse! 6. Yeah, the movers do everything. I just sit on my phone while they work! I'm sure you've had someone tell you, "What's the big deal about moving? Doesn't someone do it for you?" Um...sure. Yeah, that's how it works. 7. Housing said not to worry! The waiting list moves quickly and they promised us four bedrooms for our family of three! While we'll be happy for you if it turns out to be true, don't count on it until you have the house keys in your hand. Bwahaha, but seriously…don’t you have to think twice when asked for yours, while you can roll off the active duty person’s with the ease of a longtime auctioneer? 9. I LOVE the commissary on payday! I'm also fond of the sound of nails on a chalkboard. 10. Video chat is JUST like talking in person. Don't get me wrong--I'm ever so grateful for the ability to video chat while my spouse is deployed/TDY at most locations and realize that generations past would've loved this technology. But we all know that the delays/dropped calls/frozen screens aren’t quite a complete substitute. 11. I don't need friends. Military spouses know that friends are our chosen family and are what get us through a difficult assignment, holidays alone, overseas locations, and pretty much everything else! Need more laughs? Download our collection of 'too weird to not be true' stories in You Gotta Laugh! 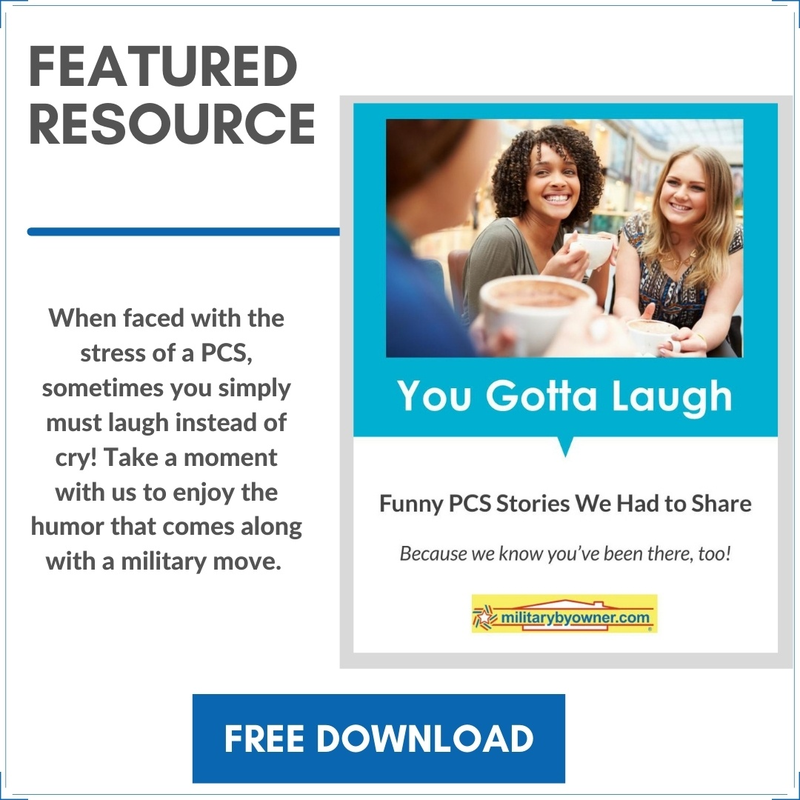 Funny PCS Stories We Had to Share. Click below to download! Special thanks to MBO writer Dawn Smith for her help with this list!